PASP has been working for children’s play for more than 20 years. We are an award-winning community-led organisation with a strong ethos of parent involvement and involving children and young people in directing our programmes. PASP began life in 1996 when Mary Fagan and a group of like-minded parents concerned about the lack of play and leisure facilities for the children got together to campaign for change. As Parent Action for Safe Play they campaigned, negotiated and built partnerships in order to turn a local derelict brownfield site into a multi-purpose play area. By 1999, the vision was achieved and a play park was opened on our Scarhill Street site. Since then, we have provided play opportunities for more than 6,000 children and their families and secured £2.4 million in funding to provide services for the community. We have been awarded the National Playing Fields Association Playground of the Year award, the Nancy Ovens Award for Play, and a Britain in Bloom Beautiful Scotland Neighbourhood Award. In 2006, we opened the Children & Youth Development Centre as venue for community events and activities. And, in 2012, as part of our commitment to the environment, we began a Growing Greener Project to reduce carbon emissions in the community with a programme of gardening, cooking, composting, recycling and energy efficient events. Now our community vegetable garden flourishes as a place to learn gardening and cooking with the help of local volunteers. PASP is now much more than a play charity, but we have not lost our focus on the importance of play in the community. With the support of Inspiring Scotland’s investment through Go2Play, we have taken play opportunities well beyond the Kirkshaws area with our mobile Play Rangers programme and Active Play and Play Champions programmes in schools. For many children and families, the freedom to play out on the streets in the local neighbourhood is far more restricted than in the past. Our programmes in local spaces have built families’ confidence about getting their children outdoors to play – with benefits not just for the children but the whole community. Parent Action for Safe Play is founded in 1996. June 1999 – Opening of the Play Park. November 2000 – National Playing Field Scotland “Playground of the Year”. 2004 – Nancy Ovens Trust Award “Outstanding Contribution to Play”. June 2006 – Opening of Children and Youth Development Centre. 2008 – Play Scotland “Outstanding Achievement for Play”. October 2009 – Beautiful Scotland “Neighbourhood Award for Improvement”. 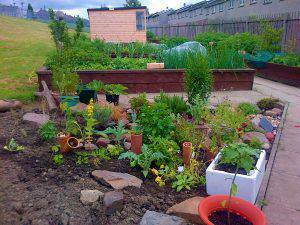 2012 – the Community Garden is planted as part of our Growing Greener Project. 2016 – PASP begins delivering Active Play in primary schools in Coatbridge and Airdrie. Today, approx 300 children attend our play facilities weekly. We are recognised for our play work and our commitment to bringing play opportunities to children in a deprived area of Coatbridge.